4H-SiC alpha detectors were fabricated with a 21-μm thick depletion depth and were packaged into a stainless-steel casing with a mineral insulation cable and a standard BNC connector. The packaged detectors had a resolution of 0.624% FWHM at 5.486 MeV prior to salt immersion. The detectors were then immersed in a LiCl–KCl–UCl3 molten salt at 500 °C, from which a thin layer of depleted uranium was electrodeposited onto the detectors. Alpha particle emission spectra were collected from the electrodeposited source. The energy resolution of the surviving detector was 2.29% FWHM at 4.198 MeV and was sufficient to separate the 234U from 238U alpha emissions (577 keV difference). 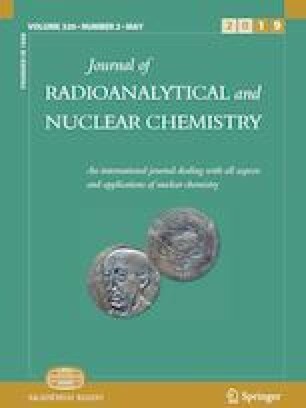 The 234U/238U activity ratio and the isotopic concentrations of 234U and 238U were determined and are representative of the uranium source used in the electrodeposition. This research is being performed using funding received from the DOE Office of Nuclear Energy’s Nuclear Energy University Program (Grant No: 15-8074). We acknowledge the staff at OSU NanoTech West for supporting SiC device fabrication.